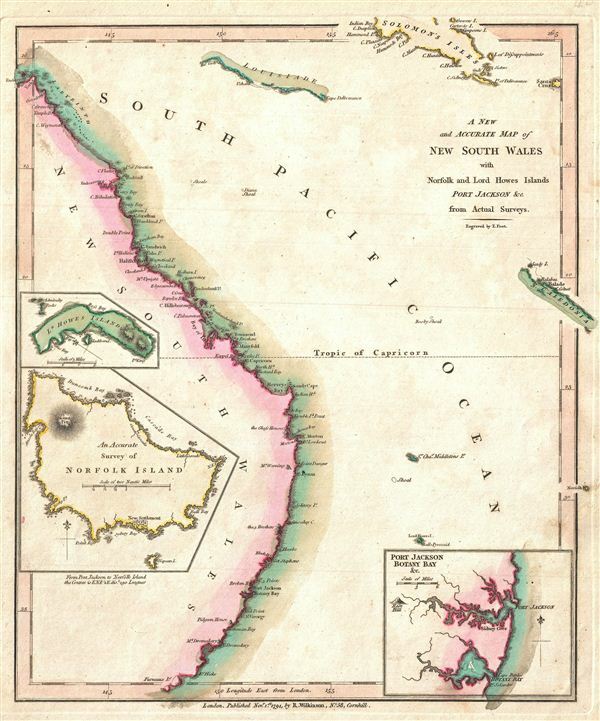 One of the first maps to detail the 1788 British colonization of New South Wales, Australia. A New and Accurate Map of New South Wales with Norfolk and Lord Howes Islands Port Jackson and C. from Actual Surveys. A finely detailed first edition 1794 map of the New South Wales, Australia, by Robert Wilkinson. One of the first maps to detail the British colonization of Australia, Wilkinson's map covers eastern Australia from the endeavors Straits south as far as Furneaux Island, including Botany Bay and modern day Sidney. New Caledonia and the Solomon Islands appear in the upper right quadrant. The region of New South Wales was named by Captain James Cook, who explored the coast in 1770. The First Fleet, as it is known in Australian history, sailed from england with 1,487 colonists to settle the Australian coast in 1787. Landing near Botany Bay in 1788, the colonists of the First Fleet founded Sydney in Port Jackson, an inset of which appears in the lower right quadrant. Another inset, in the lower left details Norfolk Island. This small Polynesian island, located roughly 290 British Leagues east of Australia, was proposed and developed by John Call as an auxiliary colony to the 1788 British settlement of New South Wales. Given its remoteness the Norfolk Island was, almost from the beginning a penal settlement, its first colonists being Lieutenant Philip Gidley King and 15 convicts. Just above the Norfolk Island inset, a third inset details Lord Howes Island. This small irregularly shaped island off the coast of New South Wales was discovered by the first wave of British colonists to enter the region in 1788. Though uninhabited until 1834, save for a large population of sea turtles, the Island's discovery was big news back in London – a fact on which Wilkinson was quick to capitalize. In general, this map offers good coastal detail, mostly gleaned from Cook's excellent maps, as well as some notations on geographical features further inland, including the Mt. Dromedary, Pidgeon House, Rose Hill, The Three Brothers, Mt. Warning, The Glass Houses, and Mt. Upright. engraved by Thomas Condar for the 1794 first edition of Robert Wilkinson's General Atlas. This is one of the earliest maps to detail the British colonization of New South Wales and was reissued with few changes in various atlases until about 1825.